Hello and Happy Hump Day! I hope you're having an awesome week! I've been sick the last 4 days so I'm hoping it will be looking up pretty soon! 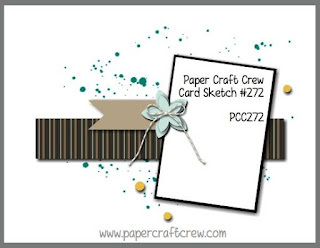 Since it is Wednesday, I'm over with the Paper Craft Crew with a Design Team Card for a sketch challenge! I think this is a super fun sketch with lots of possibilities! I decided to use the Merry Little Labels stamp set and make a Let it Snow themed card.. So when I bought this stamp set I could have sworn I had the coordinating Everyday Label Punch... well I was wrong. So I fussy cut around the stamped image... ugh! I had stamped the Let It Snow stamp with Versamark onto Dapper Denim cardstock and then heat embossed the image in white. The DSP used was from the Christmas Around the World DSP pack. I cut the snowflake in Whisper White from the Seasonal Layers Thinlits Dies. It was super fun and easy. I loved this sketch! GIU Post #5 Love Brings You Home! GIU Post #4 - Love You This Much! GIU Post #3 - Everyone You Meet! Growing In Unity Post #2 - Holy Cow! Growing in Unity - Comfort to Go! December Scrapbook Sunday Blog Hop! SIP Challenge #129 - Red, Green and Gold!